Wow!! There you are, coping with an out of control wildfire and in evacuation mode...and still creating gorgeous cards like this! That double layered embossing technique is something that I really need to try because the results are wonderful. Keeping your whole community in my prayers and hoping you can return home soon to a safe and intact home! Love that bold colors and patterns for your background...Great job! Thank you for joining our Challenge this week at Word Art Wednesday. Just want to leave you with God's Word from James 1:12 which says, "Blessed is the man who perseveres under trial, because when he has stood the test, he will receive the crown of life that God has promised to those who love him." Oh Janis - first of all I do hope this crisis passes for you and that you're soon back home in your home, and that the fires won't have caused any damage. Such a worrying time I'm sure, for you and so many others. 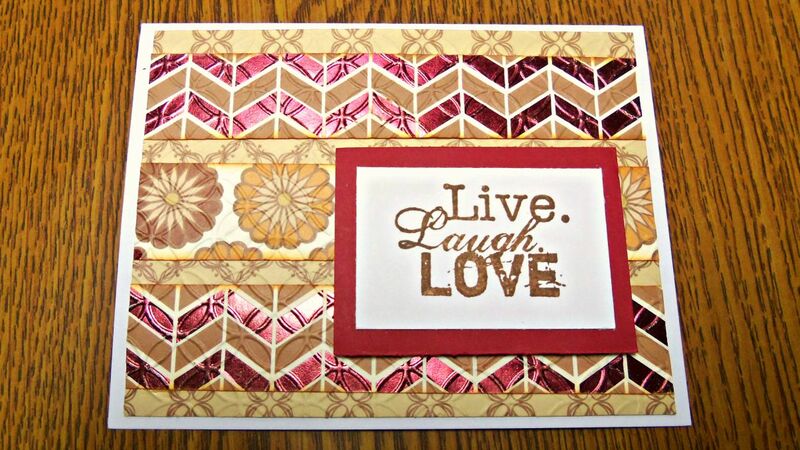 Love your card - super idea to emboss as well as using those gorgeous papers! Take care, and do keep updating us. I love these pretty patterns on this card! Beautiful! This card is so lovely!! I am glad your house is still there! I am keeping you in my thoughts constantly!! All the positive thoughts are going to you!! I giggled when you wrote you hope your Big Shot and Dies are still there!! I'm glad you keep a sense of humor during this time. Keeping you in my thoughts & prayers, Janis. Lovely card, Janis. Background paper is so beautiful and perfect for sentiment. What a fabulous background you've created with that technique - I just love the colors and patterns! Sending best wishes to you and everyone else on the west coast having to face and fight those devastating wildfires! I pray your home will be spared! Beautiful card. I love the background. Sending you good vibes for safety and being able to return home with everything intact. My cousin lives in Kettle Falls and has been evacuated too. Gorgeous! Love your kitty love pic. Hope all goes well for a speedy return to your home! Be safe, crafty friend Janis. Awesome card. Love your card, great multiple background papers! Janis, my prayers and thoughts are with you and your family at this time. I can only imagine how scary this time is for all of you. I do love your positive spirit in light of the situation. Your card is stunning. I love the bronze palette with the burgundy. Nice sentiment. Gorgeous card, Janis Fabulous colors & textures. Alaska has had our fair share of wildfires this summer as well with many homes lost. Hope yours is under control quickly! I just heard there is extra help headed your way. I love the colors and texture in this project. Stay safe.